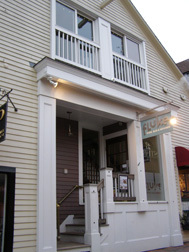 Located in the heart of historic Bowen's Wharf, Fluke Wine, Bar & Kitchen in Newport, Rhode Island focuses on relaxed modern American cuisine. The restaurant, owned by the personable Jeff and Geremie Callaghan, features the talented Chef Neil Manacle in the kitchen, an inspired cocktail menu, and fresh farm, and ocean to table cuisine. 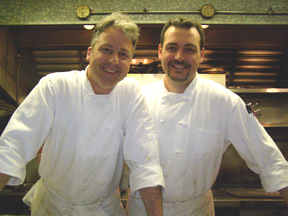 Jeff and Geremie Callaghan opened the attractive restaurant in 2007, Chef Neil Manacle who worked with notable Chef Bobby Flay, joined the team in 2009 along with Sous Chef Kevin King, who worked with Neil at Apiary in New York; together, they make an experienced and passionate team. 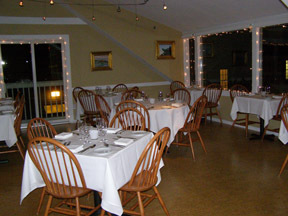 Fluke Wine, Bar & Kitchen, housed in a pretty wood shingle building in Bowen's Wharf, occupies two floors and provides guests with harbor views. Edward and I had dinner at the restaurant on a Friday night in late January 2010, where we sat at a table by a large window trimmed with white fairy lights and enjoyed our view overlooking the quaint shops and a large tree dressed with old-fashioned large white bulbs. Inside the restaurant, the tables were dressed with white linens topped with white paper, accessorized with candles in white holders, and flanked by bentwood oak chairs. A whimsical painting of a mermaid painted on what was once a bow of a sailboat graced one wall of the restaurant, while paintings of Newport in gold frames added visual appeal to other walls. The ambience is at once comfortable, warm, and welcoming with the genial Geremie working the front of the house. Fluke Wine, Bar & Kitchen takes its cocktail and spirits menu seriously, and by that I mean that the restaurant uses freshly squeezed juices, features inspired cocktails, and their list of spirits is equally impressive. Their list of rums reads like a sailing guide with stops in Trinidad, Puerto Rico, Haiti, US Virgin Islands, Venezuela, Antigua, Bermuda, Martinique, Barbados, Jamaica, Anguilla, and Dominican, or as Geremie referred to it, island sailing via the glass; with other spirits equally well-represented. Sitting on the second level of the restaurant, we could hear the distant yet distinct sound of a cocktail shaker being expertly shaken at the bar on the third level, which was music to our ears and enough to convince us to begin our evening with one of their signature cocktails, the Fluke Sunset, a delectable potent potable made with Barbancourt 3-Star, Passion Fruit, Ginger, Lime Juice, and Super POM, which our waiter shook and poured tableside. In mixing glass combine all ingredients except Super POM. Add ice, shake well and strain into chilled cocktail glass. Add Super POM then garnish with lime pinwheel atop cocktail. 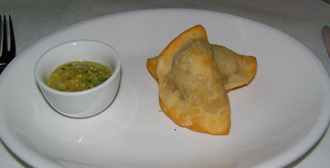 To accompany our Fluke Sunset cocktails, Chef Neil Manacle sent us an amuse bouche of delicately golden chicken empanadas accompanied by tomatillo, lime juice, pumpkin seed, and green chile dipping sauce, which was a delightful introduction to his style. 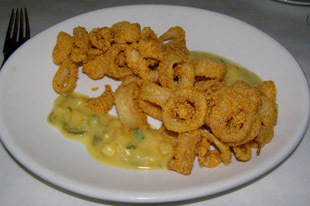 Edward continued with a first course of Cornmeal Crusted Calamari over Roasted Pineapple Green Chile Salsa, which was calamari that was lightly dusted, cooked to crispy golden perfection, and presented on a bed of roasted pineapple with a hint of spice from the chile, and the interplay of sweet and savory tempered with spice melded beautifully in this dish. 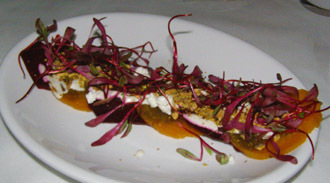 I had the Roasted Beet Salad with Toasted Pistachio Crema, which was an artistic presentation of thinly sliced alternating red and yellow beets topped with crème fraiche, chopped pistachios, and garnished with micro beet greens. For Edward's second course, he had the Shellfish Pan Roast, a lovely mélange of Scallops, Clams, Mussels, and Shrimp presented in a deep bowl with a rich broth and garnished with a grilled sliced baguette, which was reason enough to drive to Newport. Before Jeff Callaghan opened Fluke Wine, Bar & Kitchen in 2007, he represented premium wines throughout the United States, and he brings his passion and his talent to the restaurant with an impressive selection of domestic and international wines offered by the bottle, as well as wines by the glass. 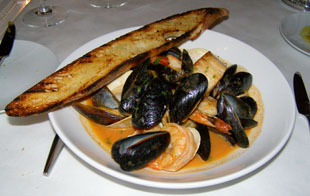 The shellfish was paired with a Clos La Chance Pinot Noir, Santa Cruz Mountains 2007. 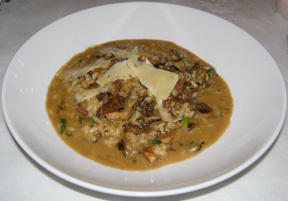 I continued with Wild Mushroom Risotto with Asiago and Truffle Oil, which was a heady mixture of wild mushrooms married to al dente risotto, with shallots, onions, and chicken broth, topped with Asiago, and enhanced with truffle oil, which was paired with a Frog's Leap Sauvignon Blanc, Napa 2008. We ended the evening on a sweet note with pastry made by Sous Chef Kevin King. 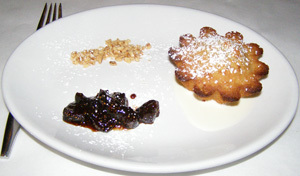 Edward had a fabulous Pear Walnut Cake with Fig Preserves, which was a delicate cake studded with poached pears, baked in an individual flute pan, and served warm from the oven accompanied by housemade fig preserves and toasted chopped nuts. 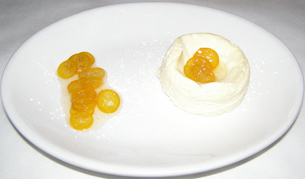 I had the Goat's Cheesecake with Candied Kumquats, which was an individual round of silky and creamy cheesecake made from a blend of goat cheese, ricotta, and cream cheese, and was enhanced with a lovely accompaniment of slightly bittersweet candied kumquat. Since the menu at Fluke Wine, Bar & Kitchen changes by the season, as well as by the catch, we cannot wait to have dinner again the next time we are in Newport. Fluke Wine, Bar & Kitchen is open during the winter from Thursday through Sunday from 5:00 pm, and is open nightly during the summer from 5:00 pm. Reservations are recommended. Read about Fluke Wine, Bar & Kitchen in the Chefs' Recipes section where Chef Neil Manacle shares his recipe for Grilled Lamb T Bones with Fried Hummus, Dates, Figs, and Apricots. Read other articles on Newport, Rhode Island in the Destinations, Hotels and Resorts, and Chefs' Recipes sections. © February 2010. Luxury Experience. www.LuxuryExperience.com All rights reserved.